TOKYO Toyota expects to sell a record 9.7 million vehicles this year, bouncing back by 22 percent from a disaster-struck 2011. It has set an even higher target of 9.91 million vehicles for 2013. The numbers released this week underline Toyota Motor Corp.'s solid turnaround from supply disruptions caused by the earthquake and tsunami in northeastern Japan in 2011 that had hurt global production and sales. They also underline the Japanese automaker's ambitions to move past the woes from massive recalls that began in 2009, especially in North America. On Wednesday, Toyota said it reached a settlement of more than $1 billion to resolve hundreds of lawsuits from Toyota owners who said the value of their cars and trucks plunged after the recalls involving unintended acceleration problems in Toyota vehicles. Under the settlement, which still needs approval from a U.S. district judge, Toyota will offer cash payments to people who sold vehicles or turned in leased vehicles between September 2009 and December 2010. It will also retrofit about 3.2 million vehicles with a brake override system, which ensures a stop when the brakes are applied even if the gas pedal is depressed. Toyota, which makes the Prius hybrid, Camry sedan and Lexus luxury models, recalled more than 14 million vehicles in 2009 and 2010 worldwide over a variety of defects, including faulty floor mats, sticky gas pedals and braking problems. Before those safety lapses, which damaged its once pristine reputation for quality, and the financial crisis that hurt overall auto sales in 2008, Toyota had been targeting global vehicles sales of 10 million vehicles. The latest target shows Toyota is well on track toward reaching its goal. Toyota is also likely to regain its crown as the world's No. 1 automaker this calendar year, dethroning General Motors (GM). Toyota sales have been roaring back in recent months, not only in the U.S. market but also in emerging markets such as Indonesia. Another sign of Toyota's determination to put its woes behind it is the record $17.4 million fine it paid earlier this month, as ordered by the U.S. National Highway Traffic Safety Administration, for failing to quickly report floor mat problems with some of its Lexus models. 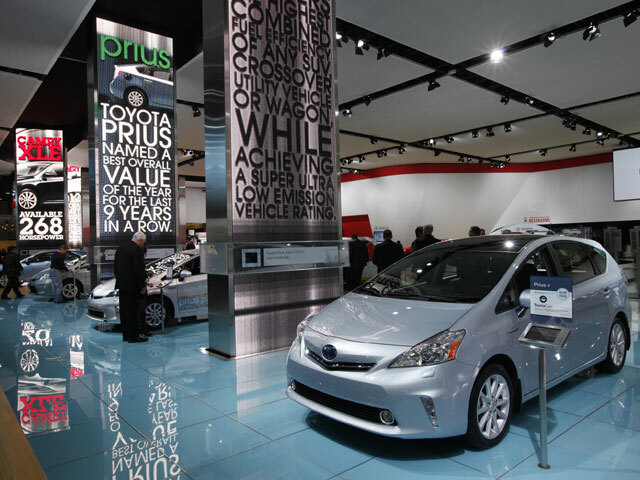 That follows $48.8 million in fines Toyota paid for three violations in 2010. But Toyota officials have said the latest fine is not an admission of a defect but a demonstration of its desire to get on with business and avoid prolonged litigation. The company has instituted more careful product development and empowered regional units to respond to complaints and to deal more quickly with quality problems. The one key market where Toyota has suffered sales declines recently is China, where a territorial dispute flared up earlier this year and set off widespread anti-Japanese sentiment, riots and boycotts. Wednesday's settlement did not include claims by people who seek compensation for injury and death due to so-called sudden acceleration. The first trial in those lawsuits is set for February. "Toyota wants to put its unintended acceleration recalls behind, once and for all, and, as costly as it might be, this settlement will allow them to remove most of the lingering financial uncertainty," said Jesse Toprak, auto analyst with TrueCar.com. "Toyota's outstanding performance this year is a proof that consumer sentiment for the company's products has already recovered to a degree as if nothing ever happened," he said.